While most fans would call Tim Burton’s 1989 “Batman” the first movie of the franchise, it technically wasn’t the first time Batman appeared on the silver screen. If you really want to go back, in the 1930’s there were two B&W serials released in theaters, but they were spread out over several chapters, so I never counted either of them as real Batman movies. 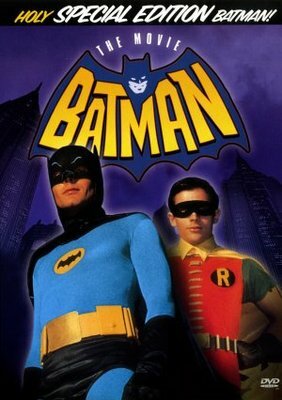 Launching Batman’s public success in the 1960’s was the now classic live action TV series starring Adam West. While campy and a little dated for today’s entertainment viewers, it was still an important part of the characters legacy, and a huge hit for its time. It had a total of 120 episodes over the cores of three seasons and was commercially successful enough to have one theatrical movie adaption in 1966 titled “Batman: The Movie”. This is it, the very first film in Batman’s long running film franchise, which could be viewed by today’s generation of fans as either one of the worst or one of the greatest entries in the series. 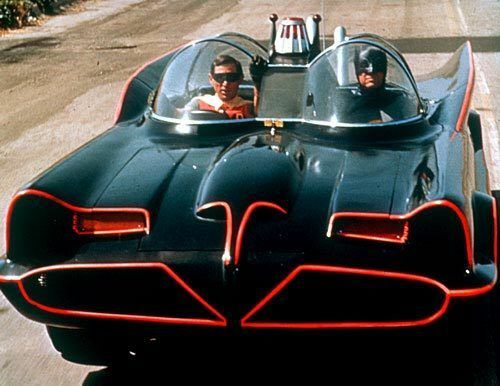 Naturally, there are those fans that choose to ignore this one, as it doesn’t contain the gothic tone or thrilling superhero action that Batman has been known for. While I’ll always prefer the darker, more realistic Batman, I still view this an iconic version of the character too, just with a completely different style and charm. It's one of those films that I don’t keep in the back of my head, but every time I watch this movie, it has me smiling from ear to ear. 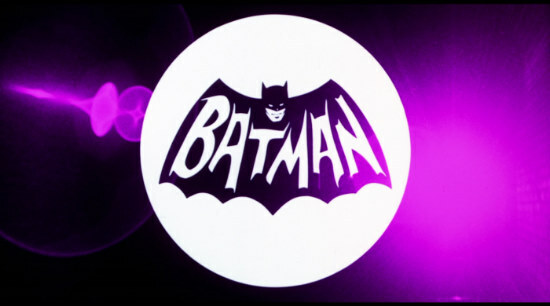 The movie begins with a colorful, comic book style opening, in which Batman and Robin are stepping into the spot light, a random guy in a trench coat is running through alleyways, the villains are sneaking in and out of different colored locations, and it perfectly sets the tone for a film that’s not meant to be taken seriously. The “story” kicks off when a boat vanishes of the coast, which was transporting a very dangerous invention that will disintegrate human tissue. Upon further investigation, our heroes discover that all four of their greatest enemies have joined forces, stolen the device and plan to use it in a scheme to take over the world. The plot is basically as cliché as it gets, but story isn’t what a film like this is about. 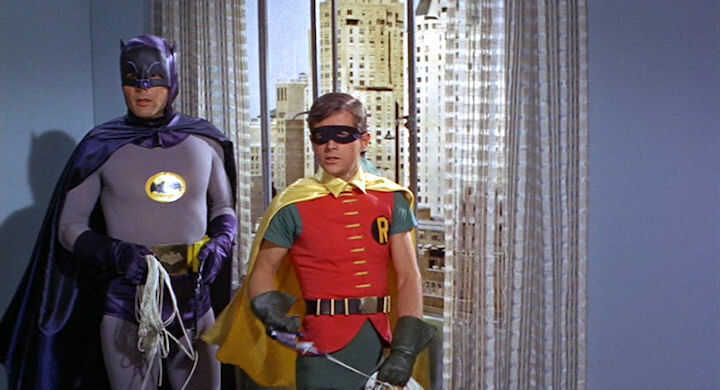 The whole appeal of the movie is just watching Batman and Robin get into one silly situation, with lots of campy fun and goofy comedy laced though-out. It’s all very self-aware and it does an excellent job turning campy antics into an art form. You can tell everyone is having a blast with every over the top, tongue-in-cheek gag, and you really have to be in the right mind set to enjoy it. 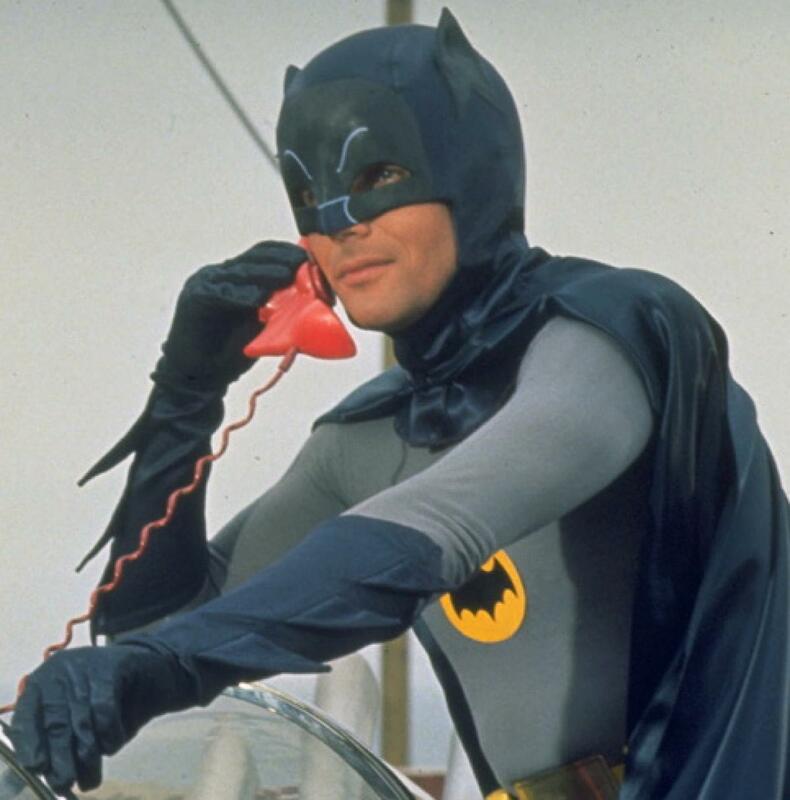 Batman is played by the late Adam West, and while I can’t say with a straight face that I’ve ever been a fan, he’s still undeniably an icon in the role. His voice is great, and he has this charm that’s all his own. However, his performance is less energetic then those around him, which makes his line delivery feel tired. Now to be fair, he must have used a lot of energy running around, doing all his physical actions. While his line delivery may seem a little dull, he certainly displayed a great deal of energy when doing the physical action. 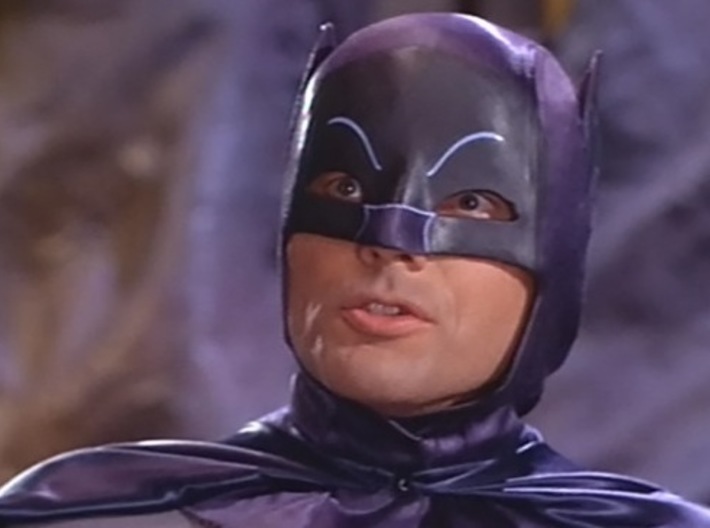 It should be noted that in this movie, Batman spends more time in costume than just about any other film in the franchise. We hardly ever see him as Bruce Wane, which is fine, I prefer watching him as Batman anyway. Having said that, Adam West dose turn up the charm when playing Bruce Wane, and actually delivers a more credible performance. Without a doubt the most famous thing about this film is that it features the biggest collection of villains to appear in any Batman movie or any superhero movie for that matter. It is an absolute joy to watch these four classic villains in the same film together, working off each other, and trying to one up the other in regards to chewing the scenery. They each have distinct personalities and each brings their own manic charm to the table. Leading this alliance of evil is The Penguin played by Burgess Meredith, who personally is my favorite of the group. 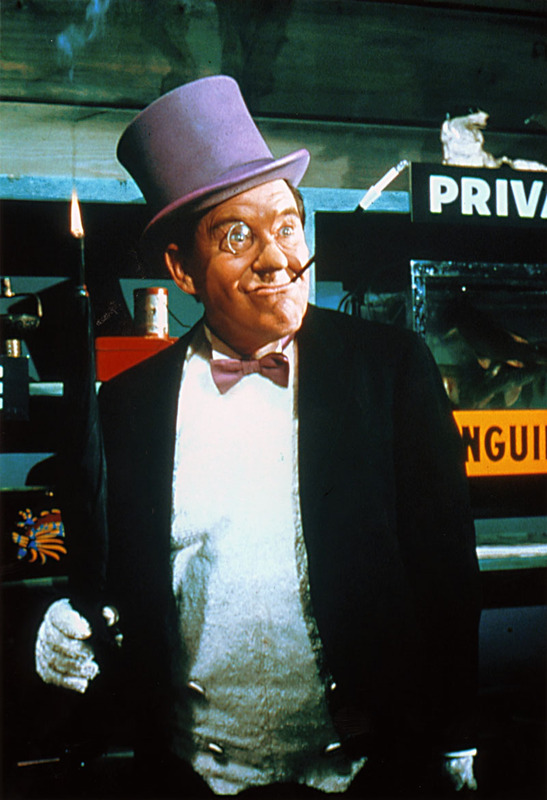 Despite being paired with so many colorful characters, Burgess Meredith simply steels the show with every scene he’s in. Whenever all the villains are together on screen, I just can’t take my eyes off him. 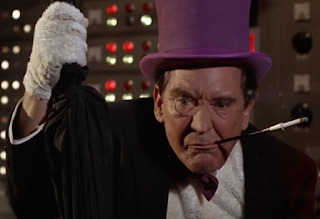 It’s actually kind of funny I say that, because of all the villains from Batman’s rouges gallery, The Penguin has always been my least favorite. Well, in this film it’s the complete opposite as Burgess Meredith just shines in the role. No one bites on a cigar while speaking with that awesome grouchy voice as well as him. While The Penguin is the one leading the united alliance of evil, the movies primary antagonist is actually Cat-woman. There's a sub-plot in which Cat-woman has a relationship with Bruce Wane, but it's only leverage, and in the end, it becomes her most powerful weapon against our hero. 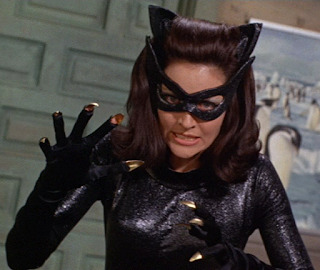 Cat-woman’s also the only player to have a cast change from the TV show. Originally, she was played by Julie Newmar in the TV series, but she was too busy at the time, so she was replaced with Lee Meriwether. I must confess, in my opinion, she is the sexiest actress to play Cat-woman. 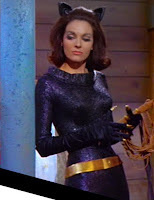 No-one movies around in that skintight outfit while purring as well as her. On that note, her purring can get a little irritating at times, as it honestly sounds like a siren you'd hear on an ambulance. While her performance is equally hammy like everyone else, Cat-woman can at least be genuinely menacing at times. Half the time, you get the impression that she’s the only villain who actually poses a threat. Then there’s The Riddler played by Frank Gorshin, and I have to be honest, he’s the most useless of the four. Really, he’s just there because he’s one of the popular Batman enemy's, but still it’s fun to have him present with the other bad guys. 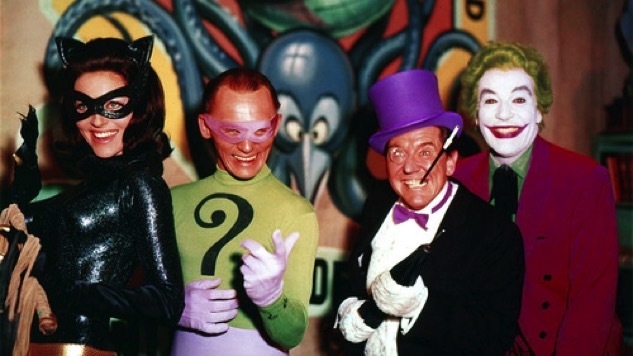 All these villains are enjoyably over the top, but I think Gorshin is trying too hard to overact everyone around him. 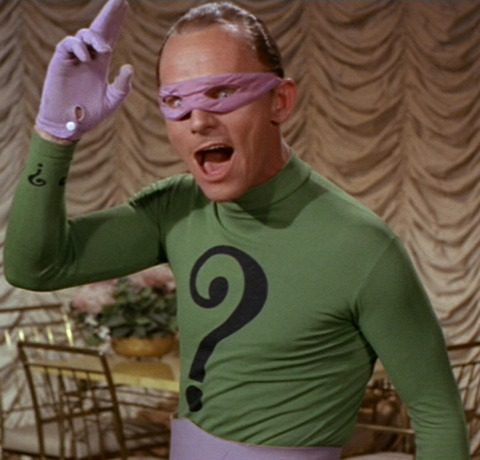 The real saving grace of the Riddler in this film are his loony riddles. Seriously, it’s a real joy seeing Batman and Robin figure them out so quickly without even taking a moment to think. 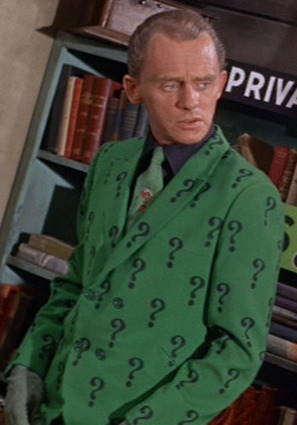 Actually, my favorite line is when Commissioner Gordon is reading one of the Riddler’s riddles … "What weighs six ounces, sits in a tree and is very dangerous? 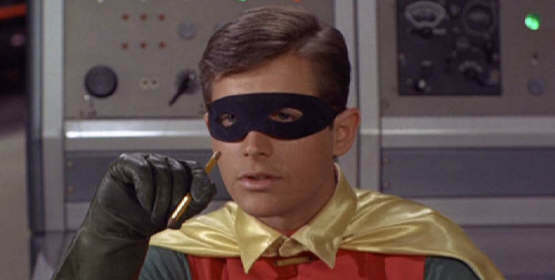 ", to which Robin responds to by saying "A sparrow with a machine gun." That's the most absurd thing I've ever heard and I love how Robin makes it sound like such an obvious answer. 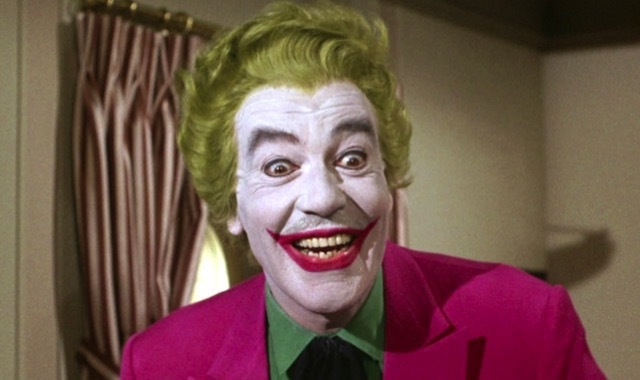 Now at last, the most celebrated villain of all is The Joker played by Cesar Romero. 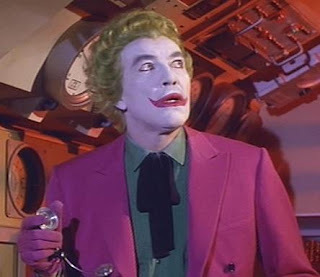 Of course, the Joker will go on to become the biggest, most recurring villain of all the Batman villains, one of the all-time greatest bad guys in film and this is the guy who started it all. There’s nothing dark or menacing about this Joker, he’s just an over the top goofball, but he is still a lot of fun to watch. 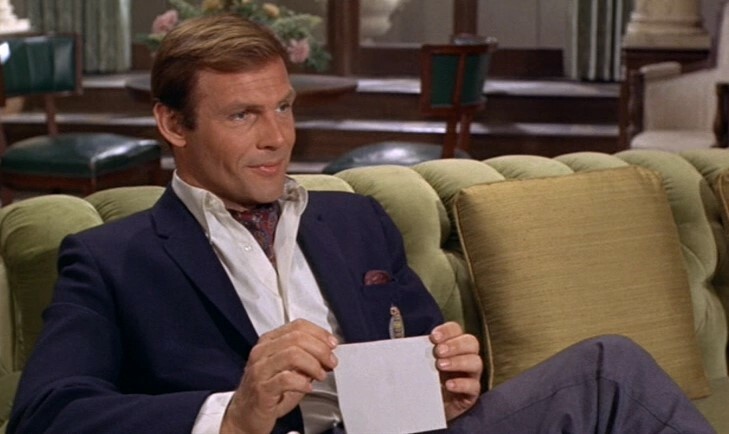 He may not seem like much when compared to other portrayals of the character, but this really was one of the break out villain performances of the 1960’s. According to Adam West, Romero was also starring in another show, where he needed his prized mustache. Thus, he refused to shave it off, and as a result, you can clearly see it under all his makeup, which is hilarious. Now you’d think that Batman’s most famous foe, would get a big part in this film, but he’s constantly upstaged by the other villains. 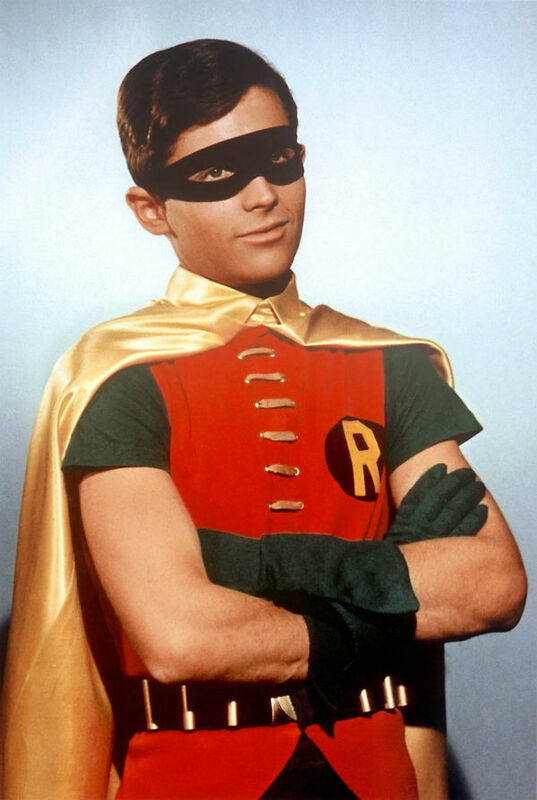 He doesn’t even fight Batman, instead he’s stuck fighting Robin … what’s up with that? Speaking of Robin, I probably should take a moment to mention him and actor Burt Ward in the role. He has little to do in the plot, and is mostly just there as the side kick, but in all honesty, he’s another really fun talent that can match the energy of the goons he battles. He might just be one of the most entertaining supporting characters to be featured in a superhero movie. A good 70% of his dialog was made up by Ward himself and let me tell yah, these are some of the most enjoyable, overacted lines I’ve ever heard. The remaining cast members do their job, but really aren’t worth mentioning in great detail. The costumes of course are all very silly and they look like outfits you can find at a Halloween costume shop. To be fair, it's the 1960's and for the time I couldn’t imagine them looking any different. The overall look of this film is enjoyably ridicules. Gotham City looks like a vacation spot in Florida, all the bat vehicles look like toys or rides that came from “Chuck E. Cheese”, and the bat cave reminds me of “Jimmy Neutrons” basement. Throughout the whole movie, you constantly see bat branded objects ranging from Bat vehicles to Bat microphones. It almost reminds of “Spaceballs”, and all the Spaceball themed merchandise that would be seen throughout the film. 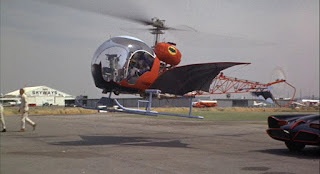 We get all the classic vehicles including the Bat mobile, the Bat motorcycle, the bat boat, and my favorite by far is the bat helicopter, which looks great, in that cheese kind of way. One thing I didn’t like was that Batman has to drive to an airport hangar to pick it up. I mean common, shouldn’t it be in the bat cave with the rest of the vehicles. I should also note that the majority of this film is set during the bright day light, which also helps it stand apart from any other Batman film. 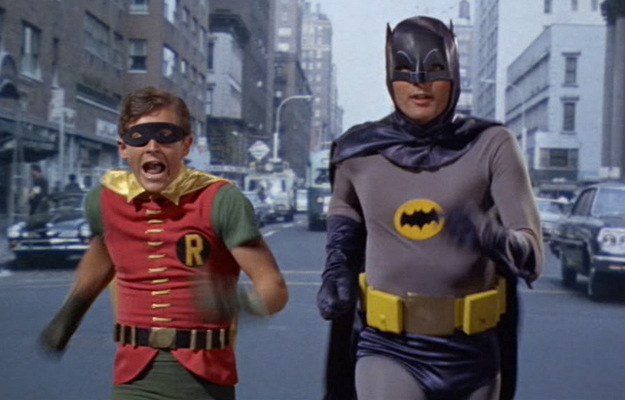 I have to admit, seeing Batman running around in broad day light just doesn’t feel fitting for the character, even with this movie’s cheesy overtone. 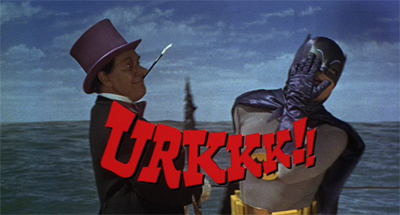 As we start the films third act, the villains succeed in kidnapping the leaders of the united nations (or at least Gotham’s version of the UN), and they take to the sea in a submarine. Batman and Robin draw them to the surface and the climax takes the form of a silly little fight on the top of the submerging. It's actually very amusing and again, it’s a rare case in which we see Batman fighting out in the day time. Another famous trade mark that came into play here are the comic book style words like “BAM” and “POW” that would show up whenever Batman hits someone. This is also the only time we see Batman fighting with a sword, as he and the penguin get into a swashbuckling dual that closes the battle. Batman also learns that Cat-Woman was never really in love and was just playing him the whole time. This leads to an awkward moment where Batman stairs off and quietly laments what could have been, only to snap out of it and say … whatever, it’s no big deal. The ending is the worst part, as it’s this long, drawn out epilogue with our heroes trying to re-organize the molecules of the UN leaders, which were previously messed up by the villains. 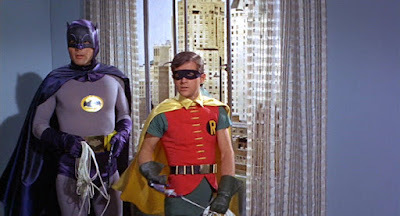 The closing shot is just Batman and Robin climbing down a building as the credits roll over it, and it’s just a generic way to close what was otherwise a very fun film. Overall, this is a movie that isn’t meant to be taken seriously, it’s where you sit back, and let loose the inner child within yourself. It’s not high-class entertainment, but it’s still a fun little waste of time. Truthfully, it’s no different than an extended episode of the TV series, so you have to judge it on it's own terms, and not in comparison to other films. It's not one of my absolute favorite Batman ventures, but it still stands apart with its own unique charms, entertaining cast, funny situations, and is easily his most light-hearted entry in the series. I give “Batman: The Movie” 3 stars out of 5. 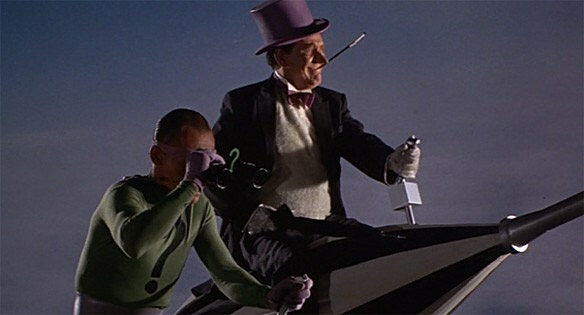 Coming up next, we’ll be transitioning from campy charms to epic battles in “The Dark Knight Rises”.